Brick Town Talk: Primarily Primary Pigments - LEGO Town, Architecture, Building Tips, Inspiration Ideas, and more! Neoplasticism Avenue - (BTT) Some people are afraid of color - not in terms of their physical well-being (I hope) but certainly enough to stick to the blander hues when designing a building. Others, however, aim for something bolder. 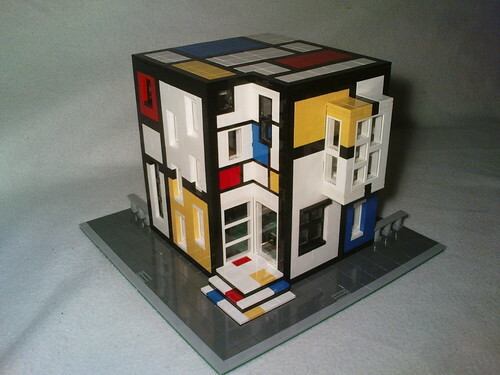 Clearly inspired by the works of artist Piet Mondrian, the architect of this house used the trademark primary colors with striking black and white backgrounds to create a dwelling worthy of display.